PGA National Fall/Winter UNLIMITED Golf Getaway for $288.00 per day! Escape winter and play in sunny Palm Beach between October and mid-January with an upscale, trendy getaway to PGA National Resort & Spa. Shape your shot on and off the course with an UNLIMITED GOLF package for $288 per person per day! Award-winning golf, luxury accommodations, and 4-Diamond rated cuisine and amenities offer the perfect backdrop for your getaway. From October 1st, 2013 through January 12th, 2014, come and stay in West Palm Beach where PGA Tour Quality golf and great value meet! 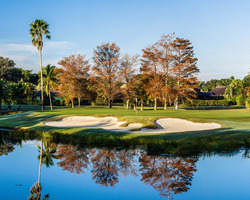 1 Round on The Champion Course - Home to the PGA Tour Honda Classic and the "Bear Trap"
This package is available from October 1st, 2013 through January 12th, 2014. Package price based on a) two golfers sharing a Deluxe Guestroom, or b) four golfers sharing a 2 Bedroom Club Cottage . Extra nights available.